by Betty Kang ~ For People_3, D:FUSE is taking the live DJ concept to a whole new level. This new 2xCD People_3 continues the concept of "both sides of the picture" with Disc 1 ‘People_Clubbing’ (live in San Francisco): the club mix was recorded live in San Francisco @ Club Mighty on July 29, 2005 featuring D:FUSE’s new live show with a full percussion set up, including his signature mix of Electronic Congas, Bongos, Tablas, and Timbales - as well as adding Tom Tom drums, Cymbals and live filter effects. The live show also included LA-based DJ/Producer Mike Hiratzka on guitar, bass, and keyboards and Austin’s MC Flint on vocals. On the flip side, Disc 2 ‘People_Chilling’ (Live in Austin): a chill-out mix recorded live in Austin, TX at the Lift Room, providing the perfect atmospheric pre-party or after-party soundtrack. People_3 is the third installment in D:FUSE’s popular compilation series, following ‘People’ released in February 2002 which immediately entered the CMJ Chart at number 9, followed by ‘People_2: Both Sides of the Picture’, a 2xCD mix for System Recordings in 2003. D:FUSE began his musical career writing and performing industrial music under the name "Culture Industry" before he turned to DJing. In 1998, he was signed to then premier electronic music label Moonshine releasing three mix compilations, and selling over 80,000 mix CDs for them. In 2001, D:FUSE was picked out of the Lone Star state for his DJ skills by Paul Oakenfold to tour with him on two consecutive North American Perfecto tours with over 50 cities and many sold-out dates. Then he followed up with a double CD mix compilation for Paul Oakenfold's Perfecto Presents series, beginning the “People” series. In 2004, he was voted URB Magazine’s #2 Artist/DJ for Winter Music Conference 2004. D:FUSE released his debut artist album ‘BEGIN’ to much acclaim in 2004 on System Recordings. The album features Motorcycle vocalist JES and twelve original tracks, plus two bonus remixes, including the hit singles "Everything With You" and "Living The Dream," with licensed compilation sales reaching well over 150,000 units. 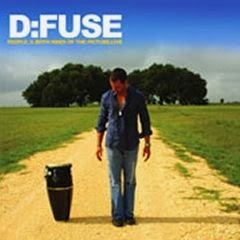 As an electronic music pioneer in alternative media outlets, D:FUSE can currently be heard on his own DJ mix show “The People’s Mix” one of America's top nationally broadcasted electronic music shows on XM Satellite Radio 80 in the primetime Saturday night spot, heard by over 150,000 "people" every week. He will be celebrating his 200th anniversary show in Fall 2005 featuring live simulcasts at clubs across the continent. D:FUSE also has a weekly Friday night show on KBIG 104.3 FM in Los Angeles and on 101X FM in Austin and is flying high on Delta Airlines in-flight music programming with his very own 45 minute ”Chill Factor” electronic channel. For more information, visit DJdFuse.com, MoistMusic.com or PlexiPr.com !